Do We Really Have to Pay the US to Take Our Electricity? For a few years now I have been listening to opponents of wind energy make claims that it is too expensive, too erratic, and we have no way of storing the excess energy for use at peak hours. I have been sceptical of these claims, but one story I read recently tops them all. On CTV news, "energy expert Tom Adams, told CTV's Queen's Park bureau chief Paul Bliss. "We have to get rid of it. It's a disposal problem and sometimes our neighbours need to get paid in order to take custody."" He was of course referring to wind energy, and the claim that Ontario must pay neighboring states to accept energy from our grid when we have too much. I don't really know if this is blatant propaganda or not, because I can imagine a situation where we would have to pay to get rid of something that might be harmful to us. In electricity, this is not uncommon actually. For example, there are times that you need to shut down a high voltage power line, and you need very expensive equipment to do it, because a sudden shut-off builds up the voltage. If you do not have this equipment, you may need to pay someone to do it for you - in theory anyway. 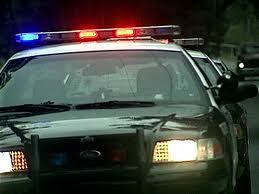 Another example of excess energy is a car travelling at high speed that needs to stop suddenly. That kinetic energy has to go somewhere, so hopefully you have brakes to disperse it. Some cars have brakes that store the energy (like the Prius). Other cars have no brakes (like my '72 Corolla after it lost a wheel strut), and you have to find some other way to get rid of your energy. If you plow into another car, that other car takes your energy, but in the end you will have to pay - either direct costs or in insurance premiums. So are we talking about some kind of shock absorbing system being provided by our neighbours, because Ontario does not possess any way to recapture excess power? Or is there actually any known way to either recapture excess power, or to at least burn it off? Wind energy opponents have told us it is not possible to store energy, which I believe is not only false and misleading, but goes against all common sense. But now apparently they are saying there is no way to even dump energy, without paying the US to do it for us. Upon researching this story further, I expected to discover that there was some unusual, hopefully temporary, situation that forced Ontario to dump excess energy into the US grid. For example, an unforeseen spike of wind energy combined with an unforeseen reduction of power requirements. In a brief span of time, it might have been impossible to shut off the wind turbines or the water power, nuclear power, gas fired, or coal power plants. So maybe we had to pay money until some parts of the energy generating system plants could be shut down. I don't know how long this might take, as I am not an "expert". But it seems to me that a month is a bit excessive simply to reduce our power output just a little. So in my opinion, this story is planted to mess with our minds, and to soften us up so that we stop questioning the anti-wind power "experts" on their outrageous statements. I do not believe that it takes a month to reduce our power output to the point where we stop paying a penalty to the US. I do not believe there is no way to burn off excess energy harmlessly. I do not believe that there is no way to store energy, although its possible that Ontario needs to build some, or more than they already have. If you want me to believe those things, a lot more explanation will be required than the statement of another energy expert. Tom Adams refers to this article "perhaps the most coherent, balanced and accurate explanation of wind power to so far appear in the Canadian print media." in his blog post titled "Excellent Journalism re. Wind in Ontario’s Power System"
"For a full month the price of our power was negative — that is, we were paying utilities in Ohio and Michigan to take it off our hands. Private energy analyst Tom Adams thinks that could happen again when we lean more heavily on wind power. Wind turbines can shut down in high wind, but Ontario would still have to pay them for the power they aren’t generating, like a diner who orders a restaurant meal and doesn’t eat it. It’s called “curtailed output.”"
The Lost Motorcyclist blog has produced a spinoff called "Lost and Burgie Go West". While The "Lost Motorcyclist" will remain to provide education and public service lessons, most of it controversial, "Lost and Burgie Go West" will be about motorcycling and travelling - kind of like "Travels With Charley" meets "Zen and the Art of Motorcycle Maintenance". Lost and Burgie plan to actually visit some of the places mentioned in ZAMM. There is one issue about motorcycle safety that I feel strongly about, but I will try to remain objective. The subject is cable guard rails beside roads. Cable guard rails are a cheap and effective way to keep cars from going too far off the road, and save in towing bills. They are made of vertical posts joined by wire cables. We have miles of this type of guardrail in Ontario. 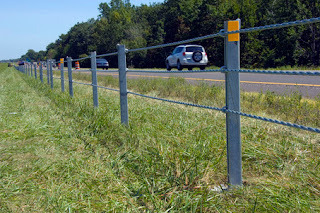 Another kind is called the armco barrier, using solid metal instead of cables. For cars, both are about as safe, although the cable type is cheaper. For motorcyclists, armco is safer than cable. A crash between a motorcycle and a guard rail is usually at a small angle. So in most cases we are dealing with a slide along the guardrail rather than a direct 90 degree perpendicular impact. The armco guardrail is generally smooth, unless you hit the first post. 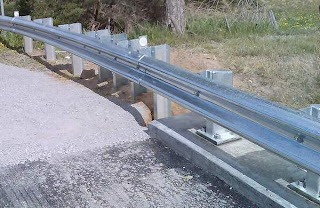 There are also problems if you slide along the top of the guardrail, as you may impact the reinforcing posts hidden behind the rail, or if you slide under, where you are more likely to strike a post if you are travelling along in the same direction as the guardrail. A motorcyclist sliding along a cable guardrail is in a lot more trouble. In many cases I have seen the cables spaced wide enough to allow a helmet to just fit between them. There is almost no chance of missing the posts, as the cables act as a guide, railroading you directly into the next post. It is especially dangerous if you are sliding along with your head between the cables, or your neck on the cable, as you head will take the full impact when you reach the post. Even with a government approved helmet, this direct impact with the post at any speed over 20 mph will result in death. I don't want to be too morbid about this, but why legislate motorcyclists to use helmets then put up guard rails that seemed designed to defeat the helmets in practice. A Subliminal Message in "Bruce Almighty"
Bruce Almighty appeared on basic cable last night. This is not a review of the movie, it is more of a lesson in spotting hidden messages after you have seen the movie. So spoilers may be coming. Obviously this movie is somewhat controversial. Bruce (Jim Carrey) is given the power of God, to see if he can do a better job. Although it is a good comedy sketch, it also is playing with subjects where people are very divided in their opinions. On one hand, you have religious extremists who believe that God exists, listens to prayers, and sends people to hell after their death. On the other, are people who believe God is an invention to help some people to manipulate others. With a controversial topic such as this, it is impossible to simply plow through the jokes and pratfalls without carrying some message about the nature of God, and whether He exists or not. For example, God is portrayed as a black man (Morgan Freeman). Already, this is reinforcing some ideas, and challenging others. For example, many southern Baptist extremists believe God is white, to support their racist ideas. This film portrays Him as black to skewer their fantasies. But what about women who have been kept in their place for centuries with the "truth" that God is a man and women are not in the image of God? Women believers will have to wait a bit longer I guess, to get a movie made for them. Aside from the obvious statements made in the movie, there are hidden statements. The controversy I am thinking about is the "Power of Prayer". Many people think praying to God will give them some advantage in life, such as money or friendship. So in this movie, Bruce is given the chance to answer prayers, and in dealing with prayer, we supposedly learn something about why God may or may not answer prayers. The ground rules for Bruce are simple, that he only controls Buffalo New York (not the whole universe), and that he, like God, cannot alter "free will". But even these ground rules, so simple in appearance, are loaded with hidden messages. Let's look at the message of a regional God first. 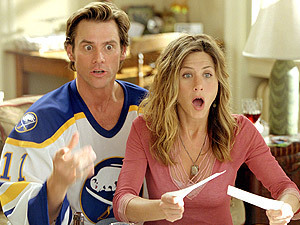 If a God can only answer prayers for Buffalo, then of course the Buffalo Sabres will win the Stanley Cup. That makes sense, and happens in the movie. But the fact is that already many people feel that God is a regional God, and this artificial limitation on Bruce's powers unconsciously reinforces ideas that God is for one chosen tribe only, and does not care about other people's suffering. Nor should the second ground rule go unchallenged, no matter how obvious it may be to some. Why is it that God cannot change a person's free will, while humans are able to? It has been demonstrated over and over that people's free wills are easily manipulated - by flattery, by fear, by appealing to greed, and even by deception. If people with their limited intelligence can control other people's free will, then why can't God? So there is a hidden message in the movie that slips by without any comment - if we accept the premise that we do have free will and that even God cannot alter it, we absorb the hidden premise that no mere mortal can affect our free will. Aside from being untrue, it leaves people open to manipulation when they absorb this hidden message. At several times during the movie, the premise that even God cannot affect free will is tested. Even using the power of television, Bruce cannot win his girlfriend's affection. Funny thing though, in real life television advertising actually works wonders on getting people to believe things, and to change their supposed free will. So in the end, of course I do not believe all the magical powers given to Bruce or God by the film makers. That was just for comedy anyway. But I also question the hidden messages - one of which is the message that we have free will that other people cannot change. We need to stay aware of the potential for propaganda, advertising, and all kinds of deceitful scams - all of which can affect people's free will. Drowsiness is a dangerous condition when riding a motorcycle or driving a car. That's why I pulled in to the service centre for a coffee yesterday afternoon. The weather has been very good for motorcycling lately, so even though it was February 5th, I was able to ride my motorcycle to Dutton to visit my mother. I went down Saturday, when it was about +4c, and dry clean roads. It was not strictly necessary at the time, but I took my electric vest. After ten minutes on the 401, I was ready to turn it on. My electric vest is without an on-off indicator. It has a switch, it just has no indication for which side is on, and which is off. Because it takes about five minutes for the vest to heat up, it would be a good idea if someone would mark it instead of just trying to memorize it. But in "The Lost Motorcyclist's" busy life I don't have the time for such things, so I try it one way for ten minutes, then try it the other. Because I was unable to feel heat either way, I kept switching back and forth all the way to Dutton. I finally decided that something was not working, and it's not that unusual because I have had three failures on previous electric vests. So once I got to Dutton, I spent the afternoon trying to figure out what was wrong with it, without using an electric tester. Yes an electric tester is the smart and fast way, unscrewing stuff and pulling at wires is the slow and dumb way, but with all my experience, I eventually unscrewed the switch and found one wire that had unscrewed itself. The next day was a little colder for the return trip. Early in the morning, I noticed frost on the bike was unusually thick before the sun came up. I prepared to leave by noon, loading a dozen eggs from my Mom. I have never carried a dozen eggs on a motorcycle, so for the first hour of my drive home went slow trying to avoid bumps. At least the electric vest was working, so once again I memorized the switch's ON position. But then I guess it was all that heat, after an hour I started getting drowsy, which is why I pulled in to the service centre and lined up at Tim's. There were about 25 people in the lineup for Timmie's, and nobody in the lineup for Starbucks. But I lined up for Timmie's instead because I only wanted to stay awake for the next 30 minutes it would take to get home, not for the next four days. As I was waiting in the Tim Hortons lineup, I realized that I forgot my money, it was back at my mother's house. Also in my wallet was all my ID, insurance etc. that I would need for a police stop, and my prescription glasses that according to my drivers licence (if I had it) I need wear while driving. So I turned around and headed back to Dutton. But first, because of the centre dividers, I had to continue on to the next town which was Woodstock. On the way back I decided to travel a teeny bit above the "unofficial" speed limit, based on the fact that I had not seen any speed traps in the last hour on the same road. Even though I had no papers with me to hand over if caught. By the time I got to London, I was keeping pace with a Mini Cooper with racing stripes, with a couple of young girls in it. They were probably immune to speeding tickets due to their youthful looks, and besides, the driver was blonde. Instead of following along and letting them take care of the fuzz, I decided to take the lead, knowing of course that there were no radar traps. Then it kind of hit me that this was almost two hours since I had gone through here, and when I did go through, it was lunch hour. As I was mulling over this uncertainty, I noticed a police car in the eastbound lane, and in my rearview mirror, saw him hit the brakes and make a U-turn. I slowed down, kind of worried, but then the two girls in the mini shot by me and I figured I was safe. Then I exited for Dutton. Another visit with my mom. She offered my coffee and cookies, even though I no longer needed to be woken up. I had forgotten about the eggs in all the excitement, so I pulled them out and they were all intact. I was surprised. Finally leaving Dutton, this time wearing my prescription glasses that I forgot the first attempt. By the time I got to the centre of Dutton (15 sec.) I couldn't see anything. My eyeglasses fog up badly inside the Scorpion EXO1000 helmet. But the helmet's 2 visors have an antifog coating, and apparently it works well. So I stopped briefly before the onramp to remove my glasses. Maybe they need that antifog coating more than the visor. On the way back east I wanted to wave to the police car sitting in the median where I left him, but he was busy pulling over some poor slob going west. And by the time I reached the exit for Kitchener, I counted three cars pulled over for speeding, one cop on a bridge with a radar gun, and seven police cars. And that was just in the westbound lanes. Anyway, as I reached my exit, I was wishing the ride could have lasted longer. I was very warm - actually my hands were sweating a little. The sun was coming out behind me - right where I like it. I was comfortable and wide awake, and feeling pretty good about being able to do so much riding in February. This year makes up for missing July and August last year. Picture: From the Internet, because I also forgot my camera.